MADISON, NJ – Wilkes University scored 24 of its 31 points in the second half but host FDU-Florham raced out to a 28-7 lead at the break and held on to a 49-31 Middle Atlantic Conference win on Saturday afternoon at Robert Shields Field. Wilkes dropped to 0-7 overall and 0-6 in MAC games following the defeat. FDU-Florham improved to 2-6 overall and 1-5 in MAC contests after the Homecoming victory. The teams went scoreless through the first quarter of play with three punts and a turnover on downs in the game’s first four possessions. 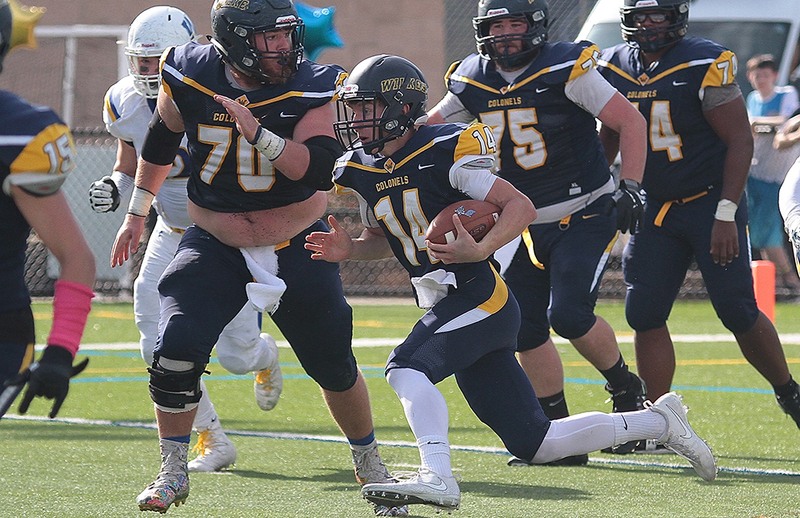 Wilkes began its second promising drive of the game early in the second quarter only to see it end when Nicholas Geimer’s scramble fell short of the first down at the FDU 29. The Devils responded with the game’s first score hitting for a 72-yard screen pass for a touchdown to take a 7-0 lead with 12:05 left in the first half. The Colonels responded on its next drive using the ground game for most of its damage. Geimer ran for 31 yards on three carries and handoffs to Sincere Williams and Jeff Steeber moved Wilkes to the FDU 5. From there a rush from Steeber moved the ball to the one before Geimer crossed the goal line to tie the game at 7-7 with 7:08 left in the half. FDU then used its big-play passing offense to take back the lead on its next possession connecting on a 63-yard touchdown. After a Wilkes punt another FDU score through the air pushed the lead to 21-7 before the Devils closed out the half with its fourth passing touchdown of the game, this time from 15 yards out to take a 28-7 advantage to the break. FDU pushed across its six passing score to start the third frame before a 91-yard touchdown extended the lead to 42-7 with 11:11 left in the quarter. Geimer found tight end Garrett Armstrong for an 11-yard score later in the third capping a 12-play, 58-yard drive to cut the deficit to 42-14 following a Mike Hauck extra point. The Wilkes defense came up with a turnover on the Devils next possession as Amari Peterson picked off a pass at midfield setting up the offense for another scoring try. The drive would stall inside the FDU 10 as Hauck made good on a 23-yard field goal with FDU leading 42-17 early in the fourth. FDU put the game out of reach with its seventh passing touchdown midway through the fourth leading 49-17 with 5:00 remaining in the contest. Geimer connected with Armstrong for the second time for a score from 10 yards out before the rookie signal-caller threw his career-best third touchdown pass, a 30-yard strike to Nick Yanik to close out the Colonel scoring. Geimer finished 25-for-41 passing for 181 yards and the career-high three scores. He also ran 29 times for 100 yards and one more score, both career-bests. The rookie account for all four of the Wilkes touchdowns. Armstrong led all Wilkes receivers with 11 catches for 88 yards and two scores. Yanik followed with six receptions for 63 yards and one touchdown. Jacob Brook topped the Wilkes defense with six tackles, while Peterson added four stops and the interception. Wilkes returns to MAC play Saturday traveling to Albright College. Kickoff is slated for 1:00 p.m.